BioKill® professional products remove malodors, surface mold, pathogens and pests and must be operated while the treatment premises are temporarily unoccupied for several hours. They are critical equipment used widely by professional businesses performing disaster recovery services. 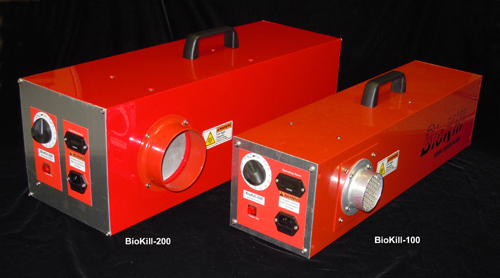 BioKill® 200 provides extra power to remove fire, smoke and water damage. High power decontaminating technology is packed into this powerful commercial equipment, making it ideally suited for decontamination of odors, chemical vapors, surface mold and spores. It uses a “suspend and eradicate technology” rather than relying on basic “ozone burn” like other products. It works by exporting an extremely high clean ozone gas concentration that dislodges and suspends treatment area contaminants. Once suspended they are sucked into the device and molecularly destroyed by the powerful cloud of super-redox radicals generated inside the unit. To accomplish this BioKill® creates “clean ozone” from natural air inside the closed treatment area, unlike basic ozone machines that need dried outside air. (Those use an electric spark that also creates toxic nitric oxide unless the air fed to them is carefully pre-dried. Also, their spark-jump plates must be continuously removed and cleaned.) 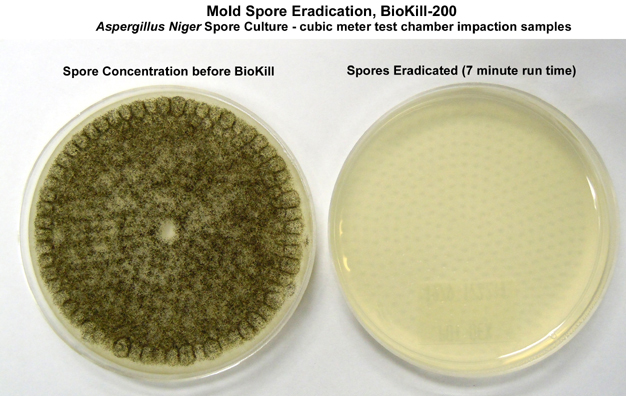 BioKill® 200 is self-contained, requires no air drying, no plate cleaning, and creates no toxic side effect chemicals. It actually benefits from moisture in the treatment area air to help create its powerful internal dismantling cloud. 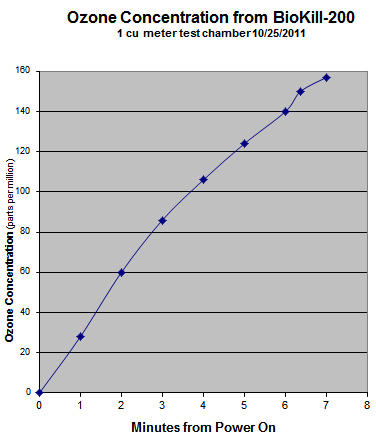 BioKill® 200 is rated at 10,000 mg/hour clean ozone output, which raises the concentration of a test chamber to over 150 parts per million in 7 minutes! That clean ozone reaches around corners and into crevices to temporarily dislodge contaminants coated on surfaces. Dense, clean ozone is highly effective itself in killing drug resistant bacteria. Gaseous ozone has been discovered to be highly effective in killing the hard to treat, drug-resistant, MRSA (Methicillin-resistant Staphylococcus aureus) pathogen. Isolates of that bacterium that are immune to conventional antibiotics, are dangerous and often lethal to medical patients. Instead of relying on its strong ozone production alone, BioKill® 200 follows through to eradicate all contaminants once they’ve been dislodged by its clean ozone. Once suspended in the flowing air, contaminants are carried into the BioKill® where they impact a dense cloud of free radicals. These highly reactive chemical species aggressively pull electrons out of long chain carbon molecules comprising the pathogen, disassembling their organic matter. Once started, the dismantling process cascades, eventually eradicating all the contaminants fragments, reverting their matter back into the natural elements from which they were composed, primarily carbon, nitrogen hydrogen, and oxygen. 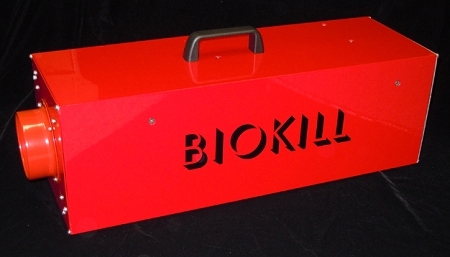 BioKill® 200 is durable with a contaminant-resistant powder-coated, extruded aluminum case. Interior components are shock-mount fitted, protecting them from rough field handling. 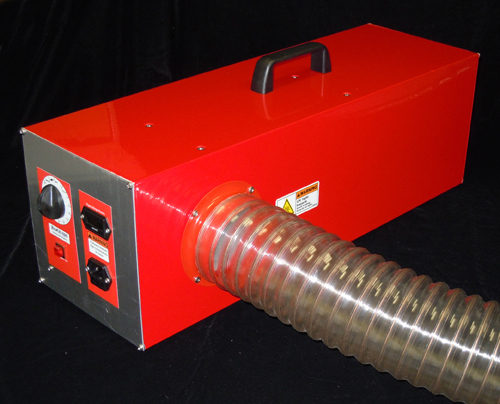 BioKill®’s air flow is driven by an industrial impeller, not a cheap fan. The control panel has an LED push button power timer plus hold position, selectable up to an automatic 12 hour unattended run time with auto shut-off. It operates on 120 VAC, 60 hz with a 10 amp fuse. A job-hours LCD meter tracks job time costs. The unit is 26” X 9.5” X 8”, weighing 32 lbs. Its lift handle makes it easy to move around on four neoprene feet to avoid marring treatment surfaces. Surface mold, mildew, bacteria, viruses and their odors are huge problems for safe living conditions. This product eliminates those problems instantly, producing miracle results, over and over.